I’d planned on this being first post being all about the brave new adventures around England I’m embarking on over the new few days. It’s wholly different from any past brave new adventure around England, as for the very first time I have a Rough Guides to Britain. And all real holidays involve a Rough Guide, so this must be one too. It’s my logic, I’ll do what I like with it. I’m hoping to find out if we’ve become the “overweight, binge-drinking reality TV addicts, obsessed with toffs and C-list celebrities” type of race that Rough Guides claim we have. So where better to visit than the origins of British civilisation epicentre that is Bath. I have only tenuous links to make such wild claims but it makes for a great introduction, doesn’t it? Bath is famous for many things, The mostly preserved ancient Roman baths (60-70AD), The Wife of Bath, Jane Austen’s residence for five years, it’s a World Heritage site, King Bladud… Wait….Who? You probably all remember the story of late King Bladud of 3,000 years ago. He contracted a disfiguring disease (hit by the ugly stick). 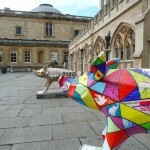 It was due to this that he was banned from the royal palace, and eventually travelled to the Avon Valley in his new line of work, “Swineherd”. Unfortunately for the pigs, they all caught “ugly” off of poor old Bladud, and it wasn’t before they went rolling in the hot mud around Bath that they became beautiful Disney pigs again. Seeing the miracle with his own eyes, Bladud joined in with the pigs in what would nowadays be called “mad”. But due credit to the guy, the magical springs did the trick and he returned to retake the throne. 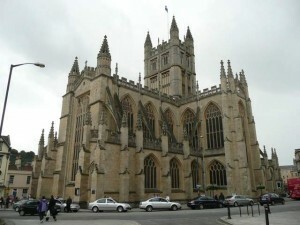 When he returned to the palace, he founded the City of Bath and dedicated it’s healing powers to the Celtic goddess Sul. And that’s why 100 pig sculptures have been modelled, painted, decorated, been displayed in the greatest commemoration of Pass The Pigs the world has ever known. Oh, and to get Bladud’s statue out of storage and into Parade Gardens, of course. They’ll all be auctioned on 31st Oct 2008. So get to Bath while you can, or get ready to place those bids. 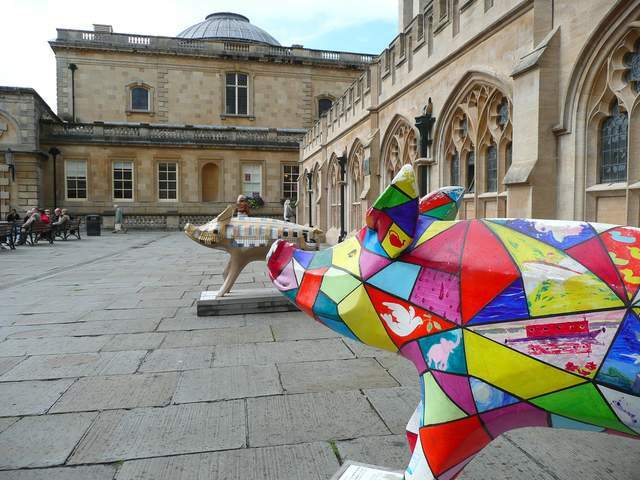 If you don’t make it, hopefully old Bladud will be back on his perch in the gardens, with a brand new pig sculpture made from Bath stone. Let’s hope so. You can buy a map of all said pigs in the tourist information for the extortionate price of 1 pound. It’s well-worth it though and an excellent way to explore the city, taking you places you’d probably raise an “eh” for, before. I managed to photograph 54 of them in my one day visit. If I had longer, I would certainly go and find the rest – but I still consider this to be a pretty good haul. My first impressions of Bath is a beautiful city, full of friendly smiling people, grand impressive architecture, sprawling green parks, and well worth the short 90 minute train journey from London Paddington. You won’t regret it. Unless you’re Jane Austen. Or you hate pigs.